This article is about the new town in North Kent. For the hamlet near Ramsgate where Hengist and Augustine landed, see Ebbsfleet, Thanet. Ebbsfleet Valley is a new town and redevelopment area in Kent, South East England, and part of the Thames Gateway, southwest of Gravesend. It is named after the valley of the Ebbsfleet River, which it straddles. Although a small part of the site in the east lies within the borough of Gravesham, Ebbsfleet Valley primarily sits in the borough of Dartford. The name Ebbsfleet is an artificial creation of seventeenth-century antiquaries, partly inspired by the name of Ebbsfleet in Thanet, 75 km (47 mi) to the east. It was announced on 16 March 2014 that redevelopment of the area would be led by a development corporation. Much of the land is brownfield and was formerly used by industry; having been previously owned by the APCM, Blue Circle and most recently by Lafarge. The new community is planned to have a population of 40,000. Ebbsfleet International railway station was opened in November 2007 and provides services to Continental Europe on High Speed 1. Domestic services to St Pancras railway station in central London are operated by Southeastern. In March 2014, the British government announced its intention to construct a garden city at Ebbsfleet for up to 15,000 homes. In November 2015, the British Chancellor of the Exchequer attempted to kick start the project by injecting ₤300m. The development is referred to as a garden city, intended to be sustainable with publicly owned infrastructure and facilities, with inhabitants working on the estates. This was said to be inspired by the Stockholm suburbs such as Hammarby where the design there is to have cycleways, and 1,500 self-build homes, houseboats and parkland. In reality, at Ebbsfleet little of this will come to fruition, only 25 of the planned 15000 homes having been completed, those built by Barratt on land sold to them by Land Securities, a major landowner. The planning committee chair, Derek Hunnisett, said "We are looking for a higher quality than the normal and what we are getting [so far] is the norm – standard off-the-peg stuff.". Despite Ebeneezer Howards's vision for garden cities to be leafy, with ample plots and a lower density than other developments: "air and water, woods and churches... in gardens with pretty self contained cottages.. there should be an abundance of living room, playing room and living room"  Ebbsfleet Garden City will not adhere to the same key design principles of a garden city. Ebbsfleet will be a much higher density housing development than an actual garden city of "30 persons per hectare". This already features multi-storey flats, and dense road layouts dominated by private parking and passageways for cars. The nearest house is less than 20 minutes walk to Ebbsfleet International station. The current development already contradicts policy and academic papers written in recent times to inform the coalition government's 'blueprint'. "A strong landscape structure, that matures over time to create a leafy green character. Tree lined streets, green verges and planted front gardens". In a contradictory move, in the following May, London Paramount Entertainment Resort were given permission to build a theme park on potential housing land on the adjoining Swanscombe Peninsula site, Nationally Significant Infrastructure Project status, allowing the developers to bypass local planning requirements and build a leisure complex that by 2019 may create employment for 27,000 people. Highways England consulted, in early 2017, about improvements to the A2 junctions in the area, citing a traffic increase of 200%. There will be a trial by BT of a fibre network in the Ebbsfleet valley, potentially offering the highest speed internet connection to home users in the United Kingdom, with the exception of Ashford in Kent. It has been confirmed they will be offering speeds of 100Mbit/s which will transfer TV, Broadband and Telephone via optical fibre. Businesses and residents of the area will be given a new telephone dialling code, 01987, though the small number of users who already have numbers allocated from the neighbouring codes (01322 or 01474) are able to retain them. The 01987 code was adopted in April 2008, in preference to the vacant 01321 code. The Ebbsfleet River is of great historical importance in English history and prehistory, and much archaeological excavation has taken place here over the years. Quarrying here has revealed signs of extensive occupation some 100,000 years ago: flint knapping was carried out here, the remains of a straight-tusked elephant have been found. Distinctive pottery from the Neolithic age has been discovered; such pots give their name to an important sub-culture of the period. Belgic Britons, in the late Iron Age have left behind traces of their culture. Prior to the construction of the Channel Tunnel Rail Link in this area, archaeological work undertaken at Ebbsfleet found an Anglo-Saxon mill. The river, which is fed by eight natural springs at Springhead (Latin: Vagniacis), was held sacred by the Celts who settled in the area around 100 BC. They were followed by the Romans; their Watling Street passes through the site, and a villa has been excavated. Many of the local chalk quarries were started by the Romans, possibly for cement manufacture and flint. The quarries were later expanded, in line with the industrial revolution, by Joseph Parker and others. A large flooded quarry, Sawyer's Lake, can be found nearby. The football team Gravesend and Northfleet FC changed their name to Ebbsfleet United F.C. in the summer of 2007. Another move to promote a sense of identity in the new town is a planned landmark, which when built will be 50 m (160 ft) high (twice as high as the Angel of the North) and is intended to be visible from road, rail and air. However, in June 2012, the project was stalled by a lack of funding. Swan Valley Community School closed in 2013, and was replaced by The Ebbsfleet Academy, a new school operating from the same building and serving the same communities, but under entirely new management and largely new staff. ^ "Chancellor announces major boost to housebuilding". 16 March 2014. Retrieved 17 March 2014. ^ "High Speed Trains". Southeastern Railway. p. 1. Archived from the original on 30 January 2009. Retrieved 10 February 2009. 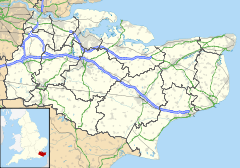 ^ "15,000-home garden city to be built at Ebbsfleet". BBC News. BBC. Retrieved 16 March 2014. ^ a b c Booth, Robert (4 January 2016). "Vision of Ebbsfleet garden city for 65,000 struggles to take root". Guardian UK. Guardian UK. Retrieved 15 January 2016. ^ a b "Sir Ebenezer Howard and the Garden City Movement". www.rickmansworthherts.com. Retrieved 23 March 2017. ^ "Castle Hill | Ebbsfleet | Barratt Homes". www.barratthomes.co.uk. 27 January 2016. Retrieved 23 March 2017. ^ Parkham, Sarah (2016). "Garden Cities, Why Not?" (PDF). The Garden City Institute. ^ Chiorando, Maria. "London Paramount park receives planning boost". Kent News. Archant. Retrieved 9 May 2014. ^ "Improvements and major road projects | A2 Bean and Ebbsfleet junction improvements". roads.highways.gov.uk. Retrieved 23 March 2017. ^ Meyer, David (10 January 2008). "BT fibre trial to start in August". ZDNet.co.uk. Retrieved 10 February 2009. ^ "Proposals to accommodate geographic number demand in the Ebbsfleet region". Ofcom. Retrieved 10 February 2009. ^ Marijke Cox (30 June 2012). "Ebbsfleet white horse stalled by lack of funding". Kent News. Retrieved 1 July 2012. ^ Edwards, Anna (12 September 2013). "No-nonsense new headteacher sent home FIVE PER CENT of pupils on first day of school for breaching strict new uniform rules". Daily Mail Online. Retrieved 12 January 2016. This page was last edited on 29 March 2019, at 13:51 (UTC).